These units can prompt you when to take your medication and dispense the tablets you are due to take. If you do not take the tablets then your help centre is automatically notified by your telecare system and can contact a carer, friend or relative who can remind or assist you. This can be helpful if you have to remember to take tablets at several different times each day or find you cannot remember whether or not you have taken your medication. As the unit only dispenses the tablets at the required time, the risk of taking a repeat dose is reduced. Most of these devices consist of rotating carousels that can be loaded with a week or a months worth of pills. 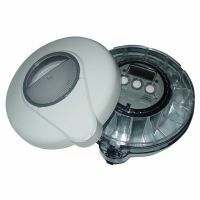 The device then offers you the right dose at the correct date and time. This works by the pill dispenser carousel rotating at these pre programmed times. An audible tone is provided as a reminder to take the medication. The device knows when the pill/s has been removed from the dispenser. 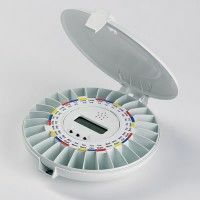 If the medication has not been taken after a preset time the system will automatically alert your help centre. 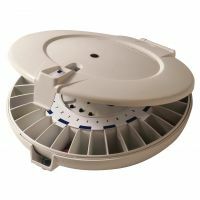 Several different models are available with larger models allowing a greater number of pills or larger tablets to be dispensed. Consider who is going to be responsible for filling the carousel with tablets and how frequently they will be able to do this. Carousels are available with up to 28 compartments. Thus this would last almost a month if you took tablets once a day or for a fortnight if you take tablets twice a day.